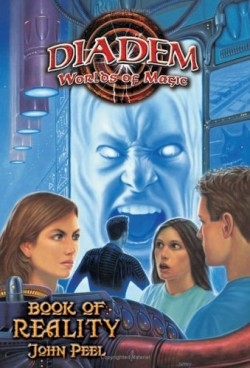 This reissue of Book Nine of the Diadem Worlds of Magic series takes four characters from the Diadem series—Pixel, Jenna, Score, and Herlaine—to Pixel’s home of Calomir, on the outer rim of the Diadem. All Pixel wants to do is visit his parents. After all, it had been a year since he had left the computer world of Calomir and found his true magical power, using his Beryl stone to shape forms from the air. Yet what he finds when he enters his world is a mystery that will take the resources of his friends to solve: Jenna, a healer with the magical talent of persuasion, focused through her stone of Citrine; Score, whose magical talent is to transform the state of objects, and who has the power of Sight with his Jasper stone; and the volatile Herlaine, who has an enhanced ability to fight. When the four discover that Calomir is ruled by the Overmind, a computer that had become self-aware and enslaved the world’s population, they seek to end its rule and free themselves and the people of Calomir, where “Answers are chains that bind you” and “Questions are wings that can free you.” The four teens find that their magic is weakened on Calomir and they use the resources of their minds, digging deeper into the Net to find the truth. However, all is not what it seems to be, and when Pixel himself transforms into a powerful sorcerer who had reincarnated as the infant Pixel and now as a teenager comes into his full power during a struggle with the Overmind, the whole balance of the Diadem is broken beyond repair. Although the author’s deft portrayal of the computer-dominated world of Calomir, with its “Supervisors” and children trapped in Virtual Reality seems to echo the movie The Matrix, this book was first published well before the movie’s release. Peel creates characters that engage the reader, with just the right blend of attraction and derision that sparks between teenagers Herlaine and Score, and the warmth of a budding romance between Pixel and Jenna. The author delivers an ending that has the reader wanting the next edition, to see just how far the balance of the worlds of magic will be broken. It is not surprising that the author also wrote installments of the “Are You Afraid of the Dark?” and “Where in the World is Carmen Sandiego?” series.